You need to clean your wood before you work with it. Whether you’re embarking on a project that involves reclaimed wood or lumber that’s been stored in a warehouse, chances are it could stand a good cleaning before you shape it into a custom cabinet or heirloom jewelry box. Do you know how to properly clean your wood? Wood soaks up moisture and that changes its dimensions and workability, no matter how subtle. Whether your wood came straight from a salvage pile or was stored in a lumber warehouse, it’s a good idea to let it dry out for a few days before beginning to work with it. If the weather is nice, allow your wood to soak up the sun’s rays for a few hours to get rid of excess moisture. Otherwise, place it in a warm, dry area with plenty of ventilation to let the dampness dissipate. Virgin lumber straight from the supply house is less likely to have major issues than salvaged or reclaimed wood, but it’s still a good idea to examine your wood before you get down to business. Keep an eye out for dirt, mold, bugs or weeping sap. Issues like these can often be solved with a good hose down, followed by another good, thorough drying. After removing major imperfections, you’ll want to sand your wood down to smoothness and remove any structural imperfections. If you’re working with reclaimed wood, pull any nails or hardware prior to sanding, that way any rust stains or discoloration goes away in the sanding process. If the wood you’re working with was previously stained or painted, now’s the time to strip it and then sand it. 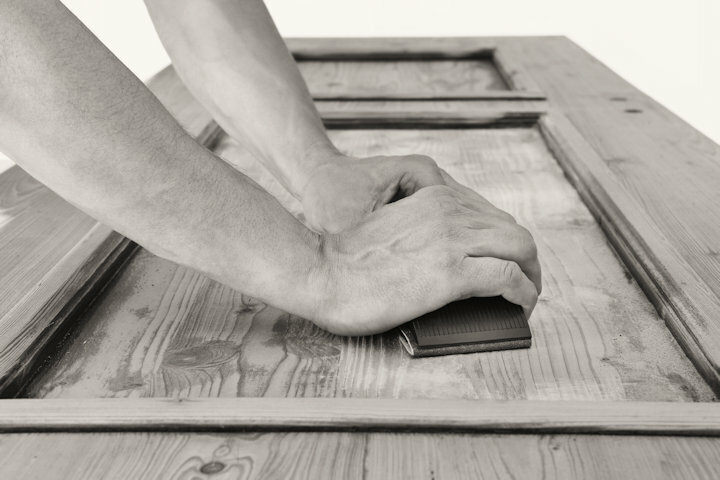 Once your wood is nice and smooth, it’s time to get down to the nitty-gritty of sanitizing it. Dry brush your wood to remove sawdust or particles from sanding to make the task easier. While drying out your wood should have killed most things, sanitizing and clearing up bugs and mildew, mold or staining is an important step. For wood that’s come from a lumber yard or warehouse, warm soapy water applied with a decent scrub brush and an appropriate amount of elbow grease should do the trick. Be sure to let it dry thoroughly afterward before working with it. Reclaimed wood might require a little more attention. A mixture of three cups borax to one gallon of water takes care of most wood-loving bugs, such as termites. Allow it to dry and brush any borax crystals from the surface before working with it. If active mold, mold spores or mold staining remains on upcycled or reclaimed wood, use a mixture of one part detergent, 10 parts bleach, and 20 parts water. Sponge or scrub on and allow to air dry before reassessing the situation. If staining or mold remains, you may need to sand the wood further and retreat it. When using chemicals to strip, clean and sanitize your wood, don’t forget your personal protective equipment. Gloves, safety goggles, and a respirator or mask are the minimum. Once your wood is clean, dry and prepped, you can begin your project. If you find yourself putting in a lot of time cleaning wood sourced from a lumber yard or warehouse, you may want to speak with them to inform them of the problem, but its par for the course when working with salvaged, reclaimed or upcycled wood. In a short article, you have mentioned an important thing. Really helpful. As a woodworker, I agree with you. Without cleaning wood, working with it is just awful.